Sault Ste. 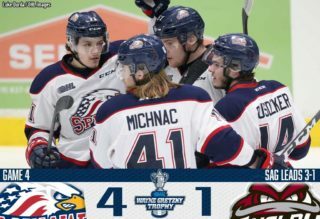 Marie, MI – The Saginaw Spirit clinch a spot in the Western Conference Championship Series for the first time in team history with a 5-0 victory in Game Six over the Soo Greyhounds. Saginaw’s Cole Coskey nearly gave the Spirit a lead in the first minute of the game. New York Islanders second-rounder Bode Wilde made it around a few Soo defenders and slid a pass over to Coskey at the right circle. The Zion, Illinois native’s wrist shot just miss the far side of the net and went wide. 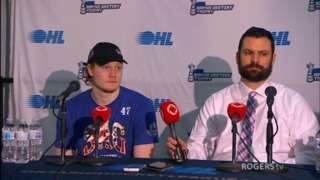 Arizona Coyotes draft pick Ivan Prosvetov was tested early by the Soo’s Zack Trott. Trott received a pass from the top of the right face-off circle and rifled a wrist shot that Prosvetov snagged with his trapper. Sault Ste. Marie, Ontario native Camaryn Baber had a great chance to put the Spirit on the board in the last minute of the period. The Saginaw center was all alone in the Soo zone on a breakaway, but Baber’s wrist shot was denied by Villalta. The two Sault Ste. Marie, Ontario native’s combined to give the Saginaw Spirit the lead in the second period. Baber fed 2019 NHL Draft prospect Nicholas Porco with a pass on a two-on-one rush and the right-winger tipped the puck into the Soo net. The goal was Porco’s third tally of the series against his hometown team. 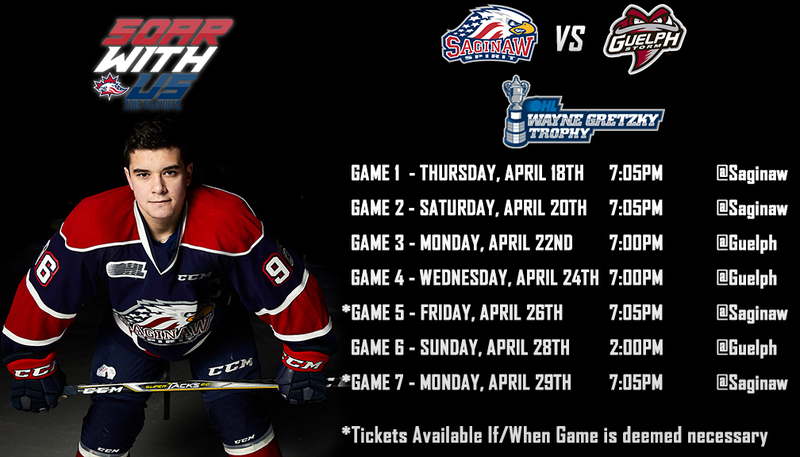 It was the first-time the Saginaw Spirit had the lead in a game since Game Three’s victory over the Greyhounds. Just over a minute after the Spirit took the lead, Saginaw alternate captain D.J. Busdeker was called for a high-sticking double-minor. The Spirit’s top-ranked shorthanded unit killed one of the biggest penalties in the post-season to keep the one-goal lead. 2018 Edmonton Oilers second-rounder Ryan McLeod gave the Spirit a 2-0 lead with just under four minutes left in the second period. Overager Albert Michnac round the Saginaw center at the point. McLeod skated down to the top of the slot and fired a wrist shot that squeaked between Villalta’s arm and body for the goal. 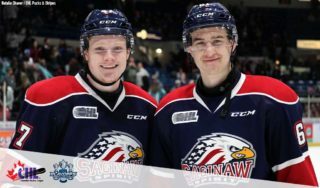 Saginaw’s net-minder Prosvetov continued to play well in the third period after Wilde was called for a delay of game penalty. The Russian goaltender stoned Soo defenseman Jacob LeGuerrier’s one-time point shot with a nice glove save to keep the Spirit ahead by two goals. Saginaw’s Jacob Goldowski added a late goal off a Soo turnover to give Saginaw the 5-0 Game Six victory.